Hormel Foods Corporation is an American food products company founded 1891 in Austin, Minnesota, by George A. Hormel as George A. Hormel & Company. 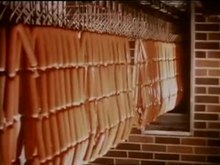 Originally focusing on the packaging and selling of ham, SPAM, sausage and other pork, chicken, beef and lamb products to consumers; by the 1980s, Hormel began offering a wider range of packaged and refrigerated food brands. The company changed its name to Hormel Foods in 1993. Hormel serves 80 countries with brands such as Applegate, Columbus Craft Meats, Dinty Moore, Jennie-O and Skippy. To make ends meet in those early days, Hormel continued to trade in hides, eggs, wool, and poultry. The name Dairy Brand was first used in 1903. :68 In the first decade of the 20th century distribution centers were opened in St. Paul, Minneapolis, Duluth, San Antonio, Dallas, Chicago, Atlanta, and Birmingham. In August 1985, Hormel workers went on strike at the Hormel headquarters in Austin, Minnesota. In the early 1980s, recession impacted several meatpacking companies, decreasing demand and increasing competition which led smaller and less-efficient companies to go out of business. In an effort to keep plants from closing, many instituted wage cuts. Wilson Food Company declared bankruptcy in 1983, allowing them to cut wages from $10.69 to $6.50 and significantly reduce benefits. Hormel Foods had avoided such drastic action, but by 1985, pressure to stay competitive remained. Workers had already labored under a wage freeze and dangerous working conditions, leading to many cases of repetitive strain injury. When management demanded a 23% wage cut from the workers they decided to begin the strike. It became one of the longest strikes of the 1980s. The local chapter of the United Food and Commercial Workers Union, Local P-9, led the strike, but was not supported by their parent union. The strike gained national attention and led to a widely publicized boycott of Hormel products. The strike ended in June 1986, after lasting 10 months.